1. Agree on relevant impacts: Metrics should be used to reflect organizational related impacts, not activities or efforts. 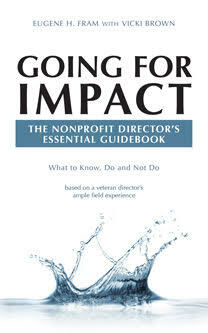 Impacts should focus on a desired change in the nonprofit’s universe, rather than a set of process activities. 2. Agree on measurement approaches: These can range from personal interviews to comparisons of local results with national data. 3. Agree on specific indicators: Outside of available data, such as financial results, and membership numbers, nonprofits should designate behavioral impacts for clients should achieve. Do not add other indicators because they are easily developed or “would be interesting to examine.” Keep the focus on the agreed-upon behavioral outcomes. 5. Compare measurement outcomes with judgment rules to determine organizational impact: Determine how may specific program objectives have reached impact levels to assess whether or not the organization’s strategic impacts have been achieved. ← Can Only Three Nonprofit Board Committees Engage Directors Meaningfully? I need help to fully understand this: “Unfortunately, outcomes and impact are often unrelated, which is why a program that seems to produce better outcomes may create no impact at all. Worse, sometimes they point in opposite directions, as can happen when a program works with harder-to- service populations resulting in seemingly worse conditions, but (has) higher value-added impact.” Can you please provide at least one example of each? In brief, many qualitative impacts are not measured. Example, a couple seeking marriage counseling works with a therapist who uses the latest treatment modalities, and the couple leaves satisfied after a year, but in two years they are having the same problems. It is evident that the modality worked temporarily but the couple did not get at the root of the problem. Accreditation of the agency may be on the basis of the modality used, but really needs to be based on the long term impact. BTW: This post is going viral. Where did you encounter it? Thank you! I’ve worked for human services nonprofits for a long time and I understand. To answer your question, I received an email notification through LinkedIn.